Research has shown Vitamin C to be the most important vitamin for stimulating the growth of collagen, the protein that gives structure and strength to our skin. As we move through life there is a natural reduction of collagen, which causes skin to wrinkle. But by stimulating the production of collagen with Vitamin C, this wrinkling can be ameliorated. What’s more, as an antioxidant, Vitamin C can help prevent the overgrowth of melanin in the skin that causes those dark spots which often increase with aging. Almost 20 years ago, a Duke University scholar published a ground-breaking paper that showed how a form of vitamin C called L-ascorbic acid reduced UVB damage when applied to the backs of hairless pigs. This evidence suggested that photodamage or “sun spots” could be repaired with topical use of vitamin C—and that was big news for anyone concerned with signs of aging! 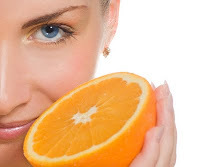 That original paper preceded an impressive and conclusive body of research that has since proven the benefits, stability issues, and usage requirements for vitamin C. Further research (lots of research) continued to show vitamin C’s positive effect on skin, and a bonafide, legitimate skincare craze was born! Regardless of marketing hype – there is no one “best” form of topically-applied vitamin C.
A proven range for vitamin C efficacy is between 0.3% and 10%. All antioxidants, including vitamin C, are vulnerable to deterioration in the presence of air and light. If a product containing antioxidants does not come in airtight, opaque packaging, don’t buy it! Many skincare products contain antioxidants, however, sometimes they can be irritants such as vitamin C in the form of ascorbic acid. What few people know is that there are two forms of vitamin C – water-soluble and fat-soluble – with distinctly different properties. This is the form of vitamin C found in standard vitamin supplements. Although I recommend taking this form of vitamin C as a nutritional supplement, ascorbic acid has some serious drawbacks when used as topical ingredient. It cannot protect cell membranes, nor can the skin maintain adequate levels when we experience oxidative stress, either from internal sources such as poor diet and stress, or from external sources such as sunlight. Ascorbic acid can also create a powerful free radical known as a hydroxylradical, via a Fenton reaction with iron in the body. It is also irritating to skin and unstable when used in topical formulations. Unlike the ascorbic acid form, fat-soluble vitamin C ester realizes this essential nutrient’s full potential as an anti-aging agent. It displays greater antioxidant activity in our cells than ascorbic acid does, and performs this vital work at lower doses. In fact, compared with ascorbic acid, vitamin C ester delivers 8 times higher levels of vitamin C activity. And because vitamin C ester can reside in our cells' fatty membranes, it continuously regenerates the vitamin E depleted by that fat-soluble antioxidant’s ongoing fight against free radicals. Vitamin C ester also possesses superior ability to stimulate growth of the cells (fibroblasts) that help produce collagen and elastin, the strands of tissue that give the skin its strength and flexibility. Last but not least, vitamin C ester is also more stable in topical solutions, maintaining its efficacy while it delivers its incomparable benefits. And it does not produce the negative Fenton reaction that occurs when products containing water-soluble ascorbic acid are applied to skin.